I was going to feel bad and apologize for my not posting on here but then I realized I did post on Friday so it is kind of still okay. This just shows that there is much more in my head that wants to be written down then I have time for. Because I also have to write down shopping lists, dreams dreamt, forms (such as the form I mailed today asking to join the Swedish Church), applications, facebook messages and beginnings of great novels. The Blue Table saw a lot of guests these last few days and I realized once again that I like my home most when there is pleasant people in it. 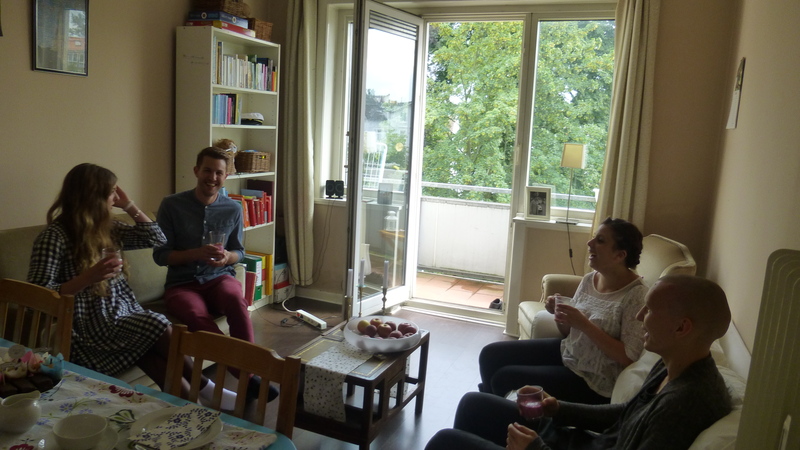 On Sunday, Kajsa and Jan, both of our Swedish-German youth group (this sounds weird), arrived an hour early for my housewarming fika. I was standing in the kitchen in my cleaning dress, sweating in 30 degrees heat, baking cakes in an apartment that was a complete mess. 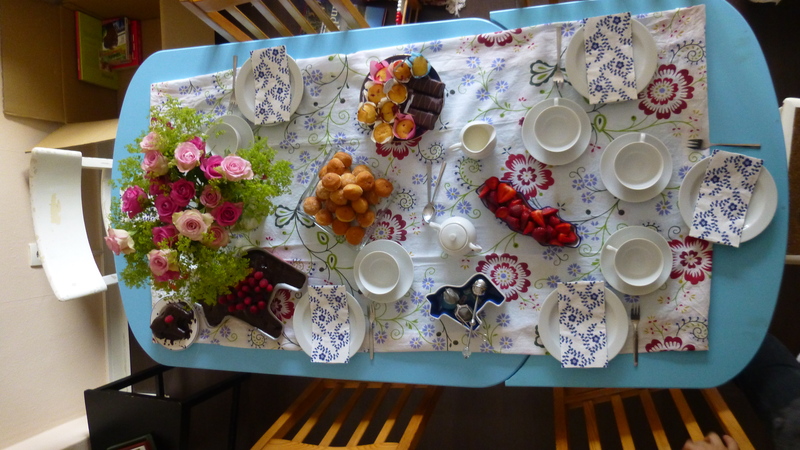 (Yes, it is a bad plan to have a completely messy place an hour before hosting a gathering.) Kajsa took control of the cake icing (with my guidance) and Jan proved to be a very skilled vaccuumer. An hour later, the rest came and we enjoyed fruit smoothies as a welcoming drink. I have a big box with nice things I am giving away and most people start digging in it when they come here. Kajsa started auctioning every item in the box and even managed to get Jan interested in some. 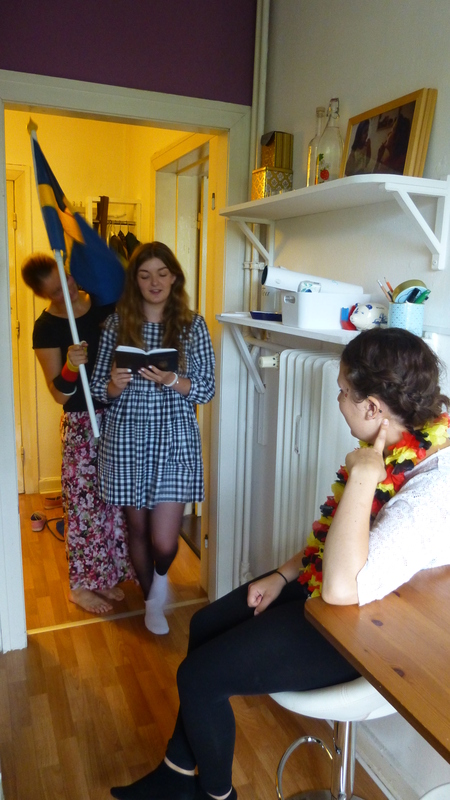 Someone also found my Uppsala songbook from Värmlands nation and the girls, unfamiliar yet with nation life, tried to sing all the songs which was quite wonderful. After the fika, Kajsa and Stephanie and I went out to watch the final game of the world cup. I will never understand why I always think you can do these things spontaneously. You. have. to. book. a. table. Otherwise you end up getting completely wet at Schanze to then take a taxi (yes…it was me who said “Kan vi inte bara åka taxi? !”) to Reeperbahn where you eventually end up outside, freezing, with very large crowds and some idiots setting off fireworks literally three meters next to you. I was so scared for my health (because of the constant shivering) or even my life (because of the Gaza-like feeling of fire next to me) that I missed the goal. I MISSED the goal. I cannot even speak about this any longer because it depresses me so much. Next time we win which will be in 2038 I will make sure to not miss the goal. The whole world cup winning contributed to me and Joraine going to bed past 1 which is deadly, absolutely deadly, for the next Monday. I had to experience that I need considerably more sleep these days and hardly survive with less than 7,5 hours. Gone are the times when I jumped out of bed with a happy face after 4 hours to tell tourists in the harbor the way to the bathroom. 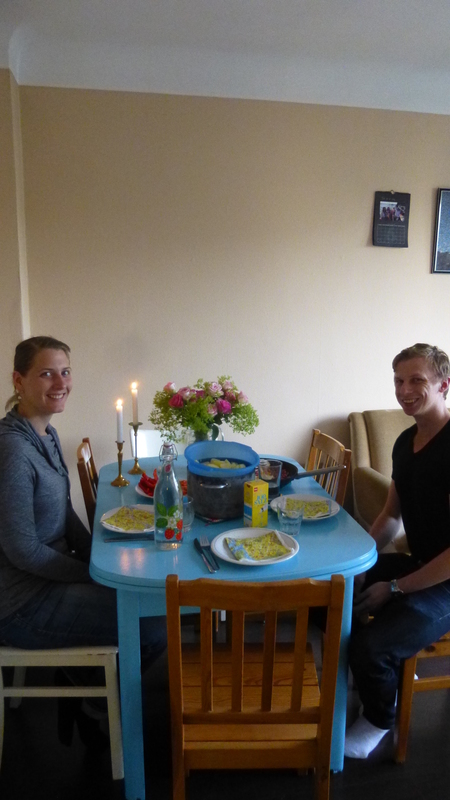 Monday became good in the evening though when Marita and Fredrik honored my home with their visit. As I said, my blue table is really upgraded by the company that sits around it!